update 7/1/2011- Way better scan! Huzzah! A product of random discussion; Zack's Nobody if he were to have one. Note that his Org. name is taken from his last name. This was moreso because I found his first name to be just about impossible to work with in terms of anagrams. One vowel plus two letters towards the end of the alphabet....yeeeah, not happenin'. 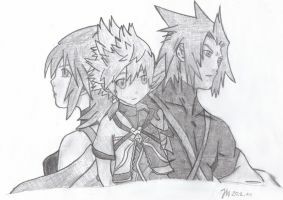 Though Xafir's my idea; Zack himself is (c) Square-Enix. Inked with Millineum ink pens. Colored with color pencils and sharpie. What is his name without the X? I was working on creating a nobody of myself incidentally XD. Still dunno what to call it. I've got 3 n's in my name . As long as you got enough vowels, you should be fine. lol hey I'm not far off my name's Shannon. Maybe the lack of an "e" is a good thing XD. awesome work sea-salt and happy b-day. Woah nice. I see the face to reseble Dragonball style and the coloring is amazing. Great job. Awwww...I didn't know that. *hugs* I'm really excited to learn some new tricks.